Millions of eggs were pulled from supermarket shelves in more than a dozen European countries in late July 2017 – and as far as Hong Kong and South Korea – after it was discovered that some had been contaminated with the insecticide fipronil. On July 20, 2017, a notification from Belgian officials via the EU RASFF portal alerted that fipronil had been found in eggs produced by some Netherlands farms at concentrations from 0.0031 to 1.2 mg/kg. The UK’s Food Standards Agency (FSA) said 700,000 eggs imported to Britain had been affected, according to the BBC’s review of the pesticide contamination crisis. The episode, which shut down 180 farms for further testing, turned into the largest egg recall in Europe. The scandal may hit Dutch farmers hard, given that 60 to 70 percent of Dutch eggs are exported to countries like Germany, which in 2016 received about 5 billion eggs from the Netherlands. And that hasn’t been the end of this pesticide-based food safety scare: On June 12, 2018, Germany recalled 73,000 contaminated Dutch eggs after fipronil residue was detected above EU limits in eggs from an organic farm. Fipronil is an insecticide of the phenylpyrazoles class used as a pesticide to protect seeds from insects; for professional pest control to combat infestation of insects such as ‎cockroaches; as well as in veterinary medicine to combat fleas, mites, and ticks on dogs and cats. Fipronil is highly toxic and it is not authorized for use as a veterinary medicine, biocide, or pesticide around food-producing animals. Hence it should never have found its way into a chicken coop. The World Health Organization (WHO) says fipronil is “moderately toxic” to people if it is eaten in large quantities, and can have dangerous effects on the kidneys, liver, and thyroid glands. It can also cause nausea, vomiting, abdominal pain, dizziness, and epileptic seizures, although its effects are reversible. Food safety authorities and the food industry are “scrambling” to assess the scale of the problem. Additional monitoring of eggs for residues of fipronil is being conducted to ensure consumer protection. There is also interest in testing egg products and meat from laying poultry. In order to monitor fipronil abuse and food safety, testing laboratories that assess imported eggs for pesticides need a simple, sensitive, and reliable analytical method for determining the presence of residues of fipronil in chicken, egg, and muscle. The residue definition for fipronil in eggs is the sum of the parent fipronil and the metabolite fipronil sulfone. Its default maximum residue level (MRL) is 0.005 mg/kg. Fipronil and fipronil sulfone can be detected and quantified by liquid or gas chromatography paired with triple quadrupole mass spectrometry, LC-MS/MS or GC-MS/MS. DisQuE dispersive SPE products, for simple and straightforward QuEChERS multiresidue pesticide extraction using AOAC or CEN methods. Oasis PRiME HLB SPE in pass-through mode, for convenient and effective removal of fats and phospholipids after your QuEChERS multiresidue pesticide extraction. Fipronil and fipronil sulfone can be determined using LC-MS/MS with electrospray ionization (EI) in negative ion mode. However, matrix effects from coeluting co-extractives can suppress the mass spectrometry signal, reducing the sensitivity of the method. An alternative is to use gas chromatography. Waters offers an atmospheric pressure GC (APGC) ionization source that can be used with GC as an inlet to a triple quadrupole mass spectrometer for trace-level quantification. APGC offers “soft” ionization, meaning that less fragmentation is observed for many compounds when compared with techniques such as EI. Reduced fragmentation can provide higher sensitivity and specificity, therefore simplifying precursor ion selection in MS/MS analyses. The advantage of using APGC for GC-MS/MS instead of EI is that fipronil retains most of the ion current in a single precursor ion, [M+H]+ at m/z 437, rather than having to select a precursor ion from the various fragment ions observed using EI (e.g. m/z 367 in Le Faouder et al. 2007). The use of APGC’s soft ionization technique combined with MS/MS improves sensitivity. While there are matrix effects associated with GC-MS/MS, these relate to mitigating the impact of active sites in the GC liner rather than ion suppression. Laboratories such as Primoris Belgium have observed lower detection limits when using APGC-MS/MS compared to LC-MS/MS. In fact, the analytical techniques are complementary – so suspicious positives determined using one technique can be confirmed using the other for greater confidence in results. An example chromatogram of fipronil and fipronil sulfone at 0.010 mg/kg (10 ppb) in egg (dilution x 10, 1 ppb in vial) in egg achieved using an APGC source with the Xevo TQ-S micro mass spectrometer is shown in the chromatograms below. Data is courtesy of Primoris Belgium, ISO17025 accredited for fipronil analysis in food of animal origin. The Waters science team has also developed and validated a new method using Oasis PRiME HLB for solid phase extraction to ensure removal of phospholipids. Following the sample prep step, we show the results of UPLC-MS/MS analysis with the Xevo TQ-XS for high-resolution quantification of fipronil and its metabolite fipronil sulfone, in eggs that meets the SANTE criteria (SANTE/11945/2015). 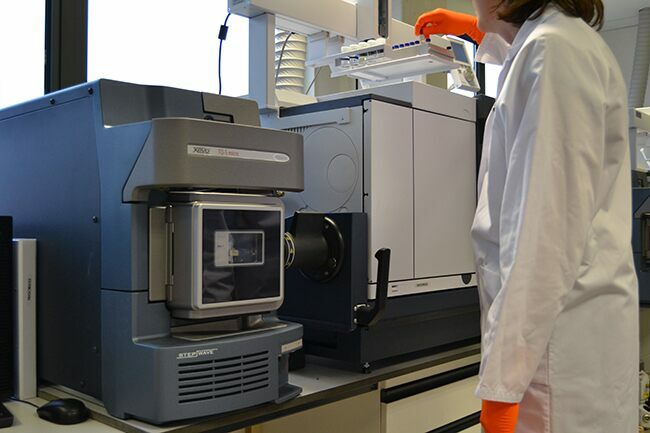 The method can be transferred to other Waters Xevo mass spectrometers. Chromatograms showing the phospholipid profiles from the analysis of QuEChERS (DisQuE) extracts of egg, before and after cleanup with Oasis PRiME HLB, with at least 95% removed. Originally published August 2017. Updated post with current literature.